I see so many books and even movies coming out recounting someone’s trip to heaven. How exciting, they got to visit personally with Jesus! They were privileged with seeing the details of heaven, like the different colors we don’t have here on earth, and the winged rainbow horse Jesus pets. So I decided to turn to the Bible and see what the Bible people who have visited heaven say about their time there. Oops. Well, not to worry, the Widow’s Son from Nain was dead and resurrected. (Luke 7:11-15). I am sure he had a lot to say about heaven. Maybe his book was lost over the centuries. I’m sure that Jairus’ daughter had a lot to say! (Luke 8:41-42, 55). Everyone else during the 2000’s seems to have so much to say about their trip to heaven! Let’s check out her trip report of the celestial places! OK, OK, surely Dorcas would speak. She owes at least that much to the dozens who pleaded for her life! (Acts 9:36-41). Certainly since Eutychus was young when he died and was resurrected and had a lot of time since his heaven tour would definitely have written a recounting of all the marvels. (Acts 20:9-10). Drat. Well, there were “many” that were raised from their graves on the day of the Resurrection of Jesus. (Matthew 27:52). 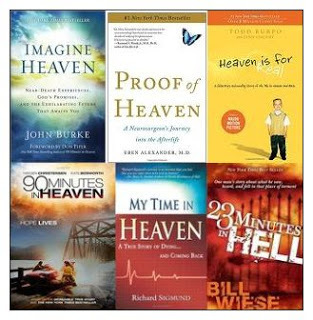 They probably wrote a lot of books all about what heaven was like, since their job was the be a witness, right? I’m so disappointed that none of the Bible people who have been to heaven (or hell) told us in detail what it’s like. I mean, “I know a man in Christ who fourteen years ago was caught up to the third heaven—whether in the body or out of the body I do not know, God knows. And I know that this man was caught up into paradise—whether in the body or out of the body I do not know, God knows— and he heard things that cannot be told, which man may not utter.” (2 Corinthians 12:2-4). Oh. It’s not lawful to speak of what you see in heaven? Paul and John and Isaiah and Ezekiel visited there and they did have a legal commission to report a few details. Paul was given a messenger of satan to help him remember not to speak of the heavenly glories. And it seems that no one else who was dead and resurrected spoke of what it’s like in heaven or hell? Paul was such a strict interpreter of God’s word! What a party pooper. So are Lazarus and Dorcas and Eutychus ad the rest, they’re falling down on the job! At least these people aren’t worried about what is lawful or not to utter! They went right ahead and uttered it! Heaven tourism seems pretty lucrative, too. So glad they are profiting from trading on Jesus name. (2 Peter 2:3). Got to make a living. I guess I’ll have to be satisfied with the lawful trip reports of heaven, from John (Revelation) and Ezekiel 1 and Isaiah 6. Editor’s Note: This essay is /sarcasm/. I do not believe the secular stories of trips to heaven, visions of heaven, and audible conversations with beings from heaven. (I’m talking to YOU, Joanna Gaines). If you’re curious about it, I believe that the best and only approach is to read what the Bible has to say about heaven. It is sufficient.